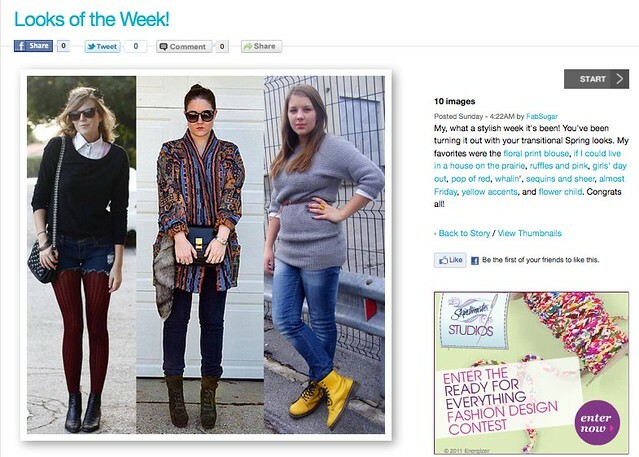 The look from my last 'Look of the Day' post was featured in FabSugar's Looks of the Week (hooray!). I love sharing my looks on FabSugar as well as seeing what everyone else has been wearing - I guess it's the anthropologist in me, but I find it so fascinating to see how differently people in different parts of the world or even different parts of the same country sartorially interpret the same point in time. To view the full gallery of this week's past looks, visit FabSugar. These are great looks! I really like the yellow docs, but overall I love the ensemble on the far left.